Enjoy a beautiful sail from Red Hook across to Jost van Dyke where we anchor in one of the scenic bays to enjoy some snorkeling, swimming or just relaxing aboard Spirit. Passports are required for this trip and after clearing Customs you will be free to relax, wander the beachfront boutiques or hang out at the local venues, such as Foxy's. 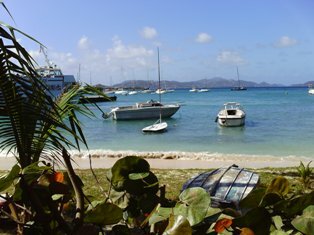 A champagne picnic lunch ashore is included while you enjoy your day on Jost. 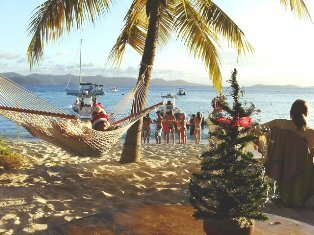 The next day can be spent with further fun on Jost van Dyke and nearby secluded islands or sail over to St John to clear back into the USVI and spend the day snorkeling and exploring the National Park with its beautiful beaches and historic sugar plantations. Spirit departs in the morning from Red Hook, St Thomas and sails across the Pillsbury sound to St. John and the Virgin Islands National Park where you have the option of relaxing in the sun, snorkeling or strolling along the beach and exploring the local historic sights. Snorkel equipment is provided. Spirit has a rear scoop with boarding ladder for easy water access. Contact your broker for current rates. Our goal is to make this your best vacation!